There are several ways that you can contribute towards the Quilts of Valor other than just coming to the QOV day at Serendipity. You can call the shop and ask for Lenny to make arrangemments for picking up or dropping off. Option 1: You can make a quilt to donate to the Quilts of Valor. Featured on the left side of this page are the basic requirements for a QOV quilt. 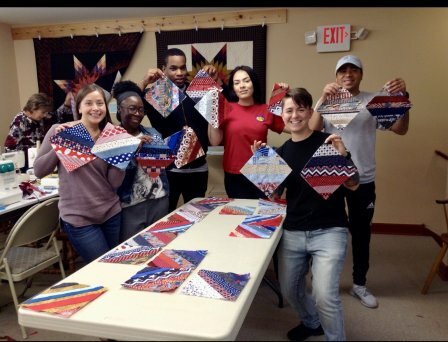 If you click on the Quilts of Valor website link on this page, they have the whole process of how to make a quilt for a Quilts of Valor donation. Option 2: You can put the binding on a quilt for Quilts of Valor. Lenny can make arrangements for you to pick up a QOV here at the shop with the material for doing binding. Option 3: If you are a Longarm Quilter, you can talk to Lenny about possibly longarm quilting QOV's. Option 4: Another way to contribute is through donations to the Quilts of Valor Foundation. QOV can always use fabric! 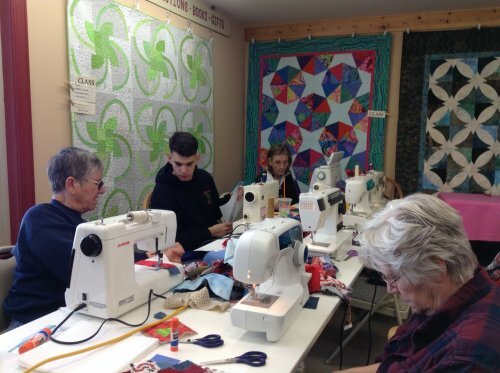 They also accept sewing machines in good working order, which are used by the public during the QOV Days to make QOV quilt blocks. Quilts of Valor also accepts monetary donations, which help in continuing to buy thread and muslin for the QOV Days and also helps with the cost of shipping QOV's to the longarm quilters. If you would like to make a donation to the Quilts of Valor Foundation, please call the shop and we will put you in touch with Lenny. What is the Quilts of Valor? 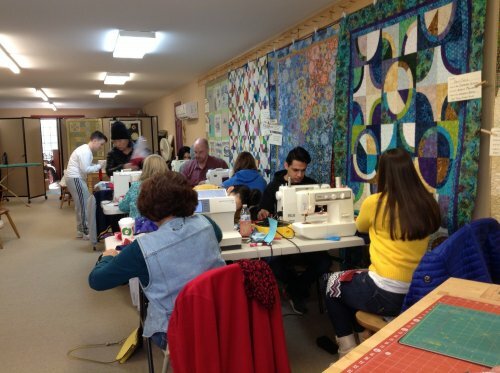 The Quilts of Valor is a foundation thats mission is to cover ALL those service- members and veterans touched by war with Wartime Quilts called Quilts of Valor (QOVs). This foundation is not about politics. It's about people. During the Quilts of Valor Day, at Serendipity Quilt Shop, we will have sewing machines set up and pre- cut fabric available for anyone who wants to come and make a quilt block or stay and make several that will go into a QOV quilt. We will have a predetermined block pattern that you will follow that is simple enough for anyone to use in making their block. No sewing experience needed! We have had men, women, and children attend and make a block. Some children even as young as 4 years old! We will also have quilts that you may volunteer to bind. You may also choose to make a pillowcase. The pillowcases are used to put the Quilts of Valor in for distribution. If you do decide to make a pillowcase, we have kits available for your purchase at $10.00 each. You may also choose to bring your own fabrics, but we ask that you use only red, white, and blues to make your pillowcase. Look below for the fabric requirements to make a pillowcase. Lenny will provide instructions on how to make them. The particular pillowcase you will be making is called a "Sausage Pillowcase", which is constructed with sewing only 3 seams. Backing 3 to 4 inches larger on all four sides. Use straight cut or bias double fold binding. Fold over backing and use as binding. Machine or hand quilting in an appropriate design. Balanced stitches of uniform size.